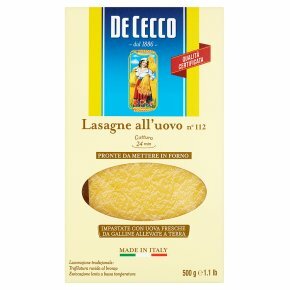 Along with all that you love most about pasta, De Cecco has added egg. The way De Cecco makes its pasta, without compromises, you found it again, in all the production phases of egg pasta: from the choice of the best durum wheats, that in the De Cecco milling become the valuable semolina large grain flour, immediately pasted to the bronze draw plates, to the slow drying at low temperature and to the exclusive use of fresh-class category barn eggs. All that concurs to obtain an exclusive and inimitable egg pasta that goes well with every seasonings. Raw in the oven (with the sauce): ca. 24 minutes.